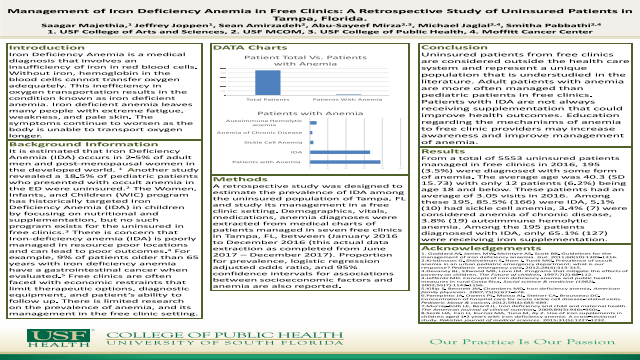 ePosters - Management of Anemia in Free Clinics: A Retrospective Study of Uninsured Patients in Tampa, Florida. Poster Title: Management of Anemia in Free Clinics: A Retrospective Study of Uninsured Patients in Tampa, Florida. Title: Management of Iron Deficiency Anemia in Free Clinics: A Retrospective Study of Uninsured Patients in Tampa, Florida. Background: It is estimated that IDA occurs in 2-5% of adult men and post-menopausal women in the developed world.1 Another study revealed a 18.5% of pediatric patients who presented with occult anemia in the ED were uninsured.2 The Women, Infants, and Children (WIC) program has historically targeted Iron Deficiency Anemia (IDA) in children by focusing on nutritional and supplementation, but no such program exists for the uninsured in free clinics.3 There is concern that Iron-deficiency anemia (IDA) is poorly managed in resource poor locations and can lead to poor outcomes.4 For example, 9% of patients older than 65 years with iron deficiency anemia have a gastrointestinal cancer when evaluated.5 Free clinics are often faced with economic restraints that limit therapeutic options, diagnostic equipment, and patient’s ability to follow up. There is limited research on the prevalence of anemia, and its management in the free clinic setting. Methods: A retrospective study was designed to estimate the prevalence of IDA among the uninsured population of Tampa, FL and study its management in a free clinic setting. Demographics, vitals, medications, anemia diagnoses were extracted from medical charts of patients managed in seven free clinics in Tampa, FL, between January to December 2016. Proportion for prevalence, logistic regression adjusted odds ratio, and 95% confidence intervals for associations between socioeconomic factors and anemia are also reported. Results: From a total of 5553 uninsured patients managed in free clinics in 2016, 195 (3.5%) were diagnosed with some form of anemia. The average age was 40.3 (SD 15.73) with only 12 patients (6.2%) being age 18 and below. These patients had an average of 3.05 visits in 2016. Among these 195, 85.5% (166) were IDA, 5.1% (10) had sickle cell anemia, 3.4% (7) were considered anemia of chronic disease, 3.8% (19) autoimmune hemolytic anemia. Among the 195 patients diagnosed with IDA, only 65.1% (127) were receiving iron supplementation. 1. Goddard AF, James MW, McIntyre AS, Scott BB. Guidelines for the management of iron deficiency anaemia. Gut. 2011;60(10):1309-1316. 2. Kristinsson G, Shtivelman S, Hom J, Tunik MG. Prevalence of occult anemia in an urban pediatric emergency department: what is our response? Pediatric emergency care. 2012;28(4):313-315. 3. Devaney BL, Ellwood MR, Love JM. Programs that mitigate the effects of poverty on children. The Future of children. 1997;7(2):88-112. 4. Jefferds MD. Concepts of iron deficiency anemia and public health measures in rural Costa Rica. Social science & medicine (1982). 2002;55(7):1143-1156. 5. Killip S, Bennett JM, Chambers MD. Iron deficiency anemia. American family physician. 2007;75(5):671-678. 6. Panepinto JA, Owens PL, Mosso AL, Steiner CA, Brousseau DC. Concentration of hospital care for acute sickle cell disease-related visits. Pediatric blood & cancer. 2012;59(4):685-689.